Account transfers occur when you move money from one account, such as your savings account, to another account, such as your checking account. 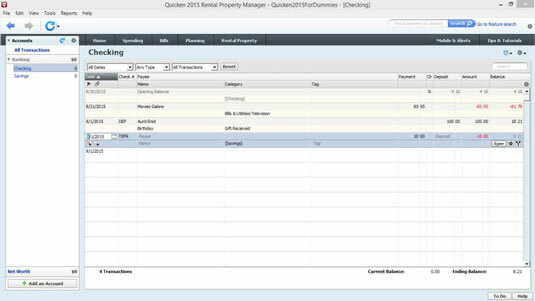 Quicken makes quick work of account transfers as long as you already have both accounts set up. Suppose that you want to record the transfer of $10 from your checking account to your savings account. Maybe you want to set aside a little money to purchase a gift for your generous Aunt Enid — perhaps a Macklemore CD. Move the cursor to the Date field. Then type the date that you move the money from one account to another. Flag the transaction as a transfer. Move the cursor to the Check Number field. Open the drop-down list box and select the Transfer entry. Quicken abbreviates transfer as TXFR. (Optional) Enter a description of the transaction. You don’t have to do this, but you may want to use the Payee field to describe the transfer — for example, Birthday. You know how this works by now, don’t you? You just move the cursor to the field. Then you pound away at the keyboard. Bang. Bang. Bang. You enter amounts that you transfer out of an account in the Payment field, and you enter amounts that you transfer into an account in the Deposit field. So move the cursor to the right field (right as in right and wrong, not right and left) and then enter the transfer amount. Enter more information about the transaction (if you need to) in the Memo field. Perhaps a gift idea for Aunt Enid? Move the cursor to the Category field, which has a modified name of Xfer Acct (standing for Transfer Account). When Quicken drops down a list box of accounts, select the other account. In the figure, the transfer is going to an account named Savings. Note that the steps for setting up a second bank account parallel those for setting up a checking account. This command tells Quicken that you want to record the transfer transaction in your register. The figure shows the Checking register after you transfer money from your checking account to your savings account so that you’ll have money to purchase something nice for Aunt Enid’s next birthday. Take a look at the Category field. Notice that Quicken uses brackets — [ ] — to identify the Category field entry as an account, not as an income or expense category.